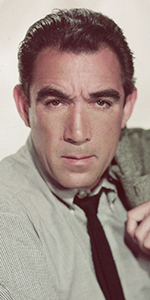 Anthony Quinn was Hollywood's first true "ethnic" star. Appearing in supporting roles in the 1930s, Quinn headlined in big-budget films after winning the Best Supporting Actor Oscar — twice. He made an awful lotta great films. Quinn was born to an Irish father and a Mexican mother; when six years old, he was introduced to Catholicism, but veered toward the Foursquare Gospel Church, eventually playing in a touring band and sharing the stage with church founder Aimee Semple McPherson. Growing up kicking around both El Paso Texas and Boyle Heights in Los Angeles, Quinn dropped out of high school to become a boxer. Switching gears, he went to study architecture with Frank Lloyd Wright. But Quinn was drawn to the stage. Wright encouraged him to follow his destiny. Arriving in Hollywood, Quinn got a gig on the Paramount lot as an extra on the the Harold Lloyd comedy The Milky Way (released in February, 1936). While there, he caught the attention of director Cecil B. DeMille, who put Quinn in his stock company, playing all sorts of "exotics." He played a Cheyenne in The Plainsman (released in November, 1936), with Gary Cooper, played a pirate henchman to Fredric March's Jean Lefite in The Buccaneer (released in February, 1938), and was in Brian Donlevy's gang of baddies in Union Pacific (released in May, 1939). He married the boss' daughter Katherine in 1937. They had five children together. Despite this, Quinn was dropped from the DeMille orbit, spending his time in "B" pictures like Island of Lost Men (released in August, 1939), and playing the not-very heavy in Road to Singapore (released in March, 1940), with Bing Crosby and Bob Hope, and also Blood and Sand (which played the Chinese in May, 1941). Quinn got a fairly big part as Chief Crazy Horse in They Died with Their Boots On (released in November, 1941), with Errol Flynn, and played a scheming bank robber in Larceny, Inc. (released in May, 1942), with Edgar G. Robinson. While Quinn's presence in Road to Morocco (released in November, 1942), with Crosby and Hope is fairly big, he was still in the background or in ensembles, such as: The Black Swan (which played the Chinese in November, 1942), with Tyrone Power, The Ox-Bow Incident (played the Chinese in June, 1943), Guadalcanal Diary (played the Chinese in November, 1943), and Buffalo Bill (played the Chinese in April, 1944). Things began to change for Quinn with his co-starring with John Wayne in the war film Back to Bataan (released in May, 1945). When Marlon Brando took a vacation from the Broadway production of A Streetcar Named Desire, Anthony Quinn was his replacement. He teamed with his other replacement, Uta Hagen, taking Streetcar on tour around the country, finally playing the Great White Way in May, 1950, but it only ran for a couple weeks. Director Elia Kazan must have liked him; after doing a bullfighting movie The Brave Bulls (released in April, 1951, where he played second-fiddle to Mel Ferrer) Kazan put him in his next film with Marlon Brando: Viva Zapata! (played the Chinese in March, 1952); Quinn got the Best Supporting Actor Oscar for his work in this film. 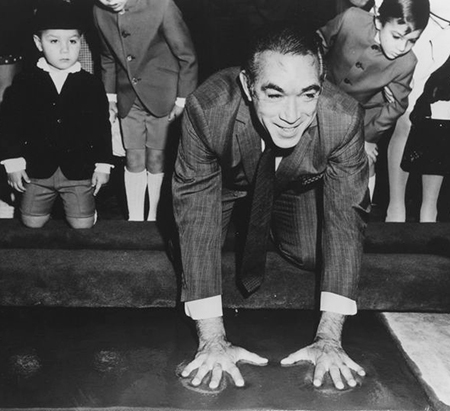 Although Quinn was still playing pirates in Against All Flags (released in December, 1952), he captured the hearts of film-goers around the world with his first signature role in Italian director Federico Fellini's masterwork, La Strada (released in September, 1954 at the Venice Film Festival). Remaining in Italy, he played Antinous to Kirk Douglas' Ulysses (released in October, 1954), and The Magnificent Matador (released in May, 1955), then played Gaspar de Portola in Seven Cities of Gold (released in September, 1955). Quinn co-starred as painter Paul Gauguin to Kirk Douglas' Vincente Van Gogh in Lust for Life (released in September, 1956), a role which won him his second Best Supporting Actor Oscar. Gina Lollobrigida would receive top billing over Quinn who had the title role in the Italian version of The Hunchback of Notre Dame (released in December, 1956),. Quinn directed The Buccaneer (released in December, 1958) for DeMille with Yul Brynner and Charlton Heston, but the result was not a happy one. He kept very busy regardless, appearing in Wild is the Wind (released in December, 1957), Last Train from Gun Hill (released in July, 1959), Heller in Pink Tights (released in January, 1960), and The Savage Innocents (released in February, 1961). Quinn had a great (though still supporting) role in The Guns of Navarone (released in April, 1960), then went to Broadway to star as King Henry II, in Becket with Laurence Olivier in the title role, for 193 perfs from October, 1960. He left the show to star (finally) in Barabbas (released in December, 1961). Growing older and heavier, Quinn returned to boxing in Requiem for a Heavyweight (released in October, 1962), then played Howeitat shaikh Auda Abu Tayi in director David Lean's masterpiece, Lawrence of Arabia (released in December, 1962), with Peter O'Toole in the title role. He accepted the title role in Alexis Zorbas - Zorba the Greek (released in December, 1964), which became a world-wide smash hit, paving the way for Quinn to star as a reluctant Pope in The Shoes of the Fisherman (released in November, 1968). Director Stanley Kramer had him lead The Secret of Santa Vittorio (released in October, 1969), while director Carol Reed had him play a Native American troublemaker in Flap (released in November, 1970). Universal put Quinn in a television cop show The Man and the City for 15 episodes aired over ABC from September, 1971 to Janaury, 1972. He published his autobiography, The Original Sin: A Self-Portrait in October, 1972. He then played a Mafia don in The Don Is Dead (released in November, 1973), and portrayed Aristotelis Onassis in The Greek Tycoon (released in May, 1978). Quinn starred in a revival of the Kander & Ebb musical version of Zorba on Broadway for 362 perfs from October, 1983 to September, 1984. Always finding something to do in Italy, he starred as Long John Silver in a television movie, L'isola del tesoro - Treasure Island in Outer Space aired over RAI, in November, 1987, then appeared in the notoriously awful Ghosts Can't Do It (released in October, 1989), with Bo Derek. and plays a mobster in Last Action Hero (released in June, 1993). Beginning with Hercules and the Amazon Women, aired over NBC, in April, 1994, he played Zues in four more Hercules television movies. Quinn played host in a television game show / reality TV / hybrid, La noche de los castillos for eight episodes over La 1 in September, 1995). Another Quinn autobiography, One Man Tango, was published in 1995. Retiring (sort of) to Bristol, Rhode Island, Quinn died of complications from throat cancer in June, 2001, at the age of 86. Quinn's final film was released posthumously, Avenging Angelo (released in August, 2002 in Italy, straight to video in May, 2003 in the U.S.), with Slyvester Stallone. Grauman's Chinese Theatre, Hollywood, California. 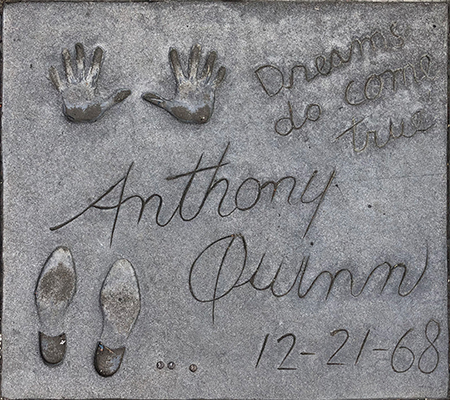 Anthony Quinn Forecourt ceremony, Monday, December 21, 1968. Mr. Quinn's chidren, Lorenzo (left), Danny (with most of head cut off), and Francesco(right) look on as dad places his hand in the cement.